The underpaid graphic department at EXTINCTION would like to present this obvious composite picture passed off as a scene from the movie. A working class family man is plagued by dreams of alien invasion. One day, his dreams come true. And the question becomes: Can he access those prescient dreams to navigate his family to safety? Then we find out his question was answered – in his past! Set in the near future, EXTINCTION is a dichotomy of disaster-movie tropes and cutting edge story-telling. Movie depends too much on the audience’s love of mindless action to propel it to the very good story reveals after the Second Act. Problem is: if you are a Discerning Viewer, the mindless action might turn you off before the story gets to its grand message. All I could think of when buildings were being blown up and faceless aliens were chasing our heroes down corridors and shooting and missing them, was the unimaginative writing in making the aliens’ tactics so agrarian-era human. Michael Peña is the family man, Peter. (I love Michael Pena in this straight role! He sells the movie with his stoic underplaying, saving it from schlockfest. Usually cast as comic relief or B-character, EXTINCTION marks another in Pena’s growing list of dramatic leading man roles, where he can showcase his considerable talents.) An electrician in a straightforward job, Peter seeks medical help to account for his disturbing dreams, which are taking their toll on his wife (Lizzy Caplan) and his relationship with his young daughters (Amelia Crouch and Erica Tremblay). When propped up against the reveals, the action is still mindless: for example, an alien ship is seen blasting a building to pieces, atop which people are screaming, yet in Peter’s building the aliens are sending in ground troops to sweep the apartments and individually kill people. Why? Just BLAST PETER’S BUILDING AS WELL! These invasion scenes are the height of clichéd and unimaginative. We are so used to seeing war movies where ground troops invade a dwelling to sweep it for life that we hardly blink at this tactic which is unnecessary and time-wasting when you have the capability to simply BLAST the dwelling. 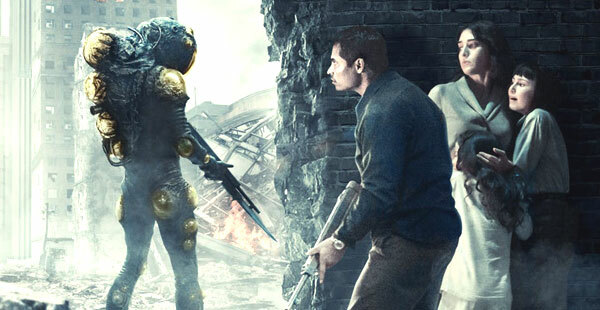 This low-budget sci-fi actioner (directed by Ben Young for Netflix) is not much more than its invasion scenes (which consist of ALL the faves: barricading doors, hanging from buildings, enemies shooting our running heroes down hallways and hitting nothing but hallway, child frozen in fear grabbed by parent and carried to safety, hand-to-hand combat, hiding behind things, Pretty Orange Explosions, and people saying, “Get the hell outa there!”) and a good reveal – what most viewers these days would call a “twist” – but it’s not actually – just a very good plot reveal. Opening with Peter questioning “What are we?” and ending with Peter knowing the answer, EXTINCTION is not as profound as one might hope it to be, but it’s not as mundane as its opening scenes seem intent on making it. Writers: Spenser Cohen, Brad Kane, Spenser Cohen, Eric Heisserer. Starring: Michael Peña, Lizzy Caplan, Amelia Crouch, Erica Tremblay, Alexander Shrapnel, Emma Booth, Lilly Aspell, Mike Colter, Israel Broussard, Sandra Teles.